After a two-year hiatus, Catwoman returns in a new on-going series with writer-artist extraordinaire Joëlle Jones this summer. But first, she has to tie the knot with an eccentric billionaire who has an extraordinary nightlife in 'Batman' #50. Announced during Saturday's Batman panel at C2E2, Selina Kyle's new solo monthly series will branch out of her nuptials to Batman in BATMAN #50. The press release dismisses any romantic honeymoon afterglow following the wedding. Instead, the premise of her new comic has "Catwoman back on the streets dealing with a mysterious copycat and taking on a brand new, as-yet-unrevealed villain in the Eisner nominated Jones’ debut storyline." Jones has been one of my favorite comic book creators for a long time. Her impeccable art style on series like 'Helheim,' '12 Reasons Why I Love Her,' and 'Supergirl: Being Super,' to her creator-owned series 'Lady Killer,' has cemented her place as a bonafide star on the rise. She's finally getting the recognition she deserves by doing the writing and penciling on the 'Catwoman' series with another talented artist in colorist Laura Allred. 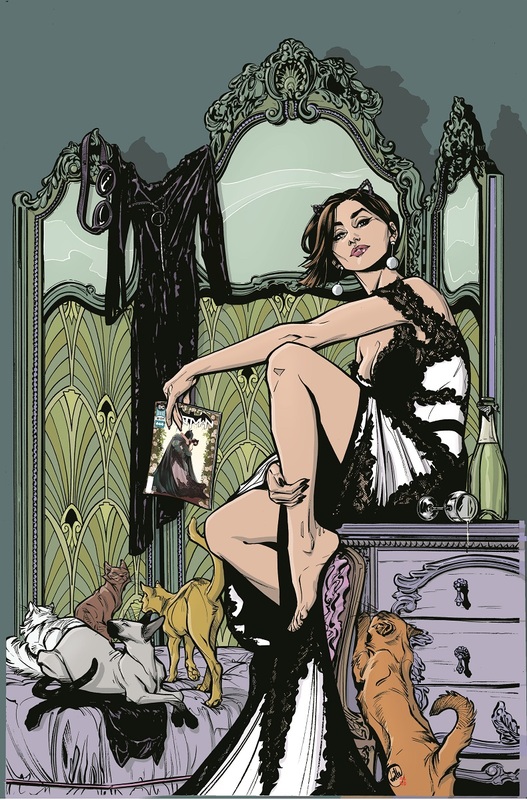 DC Comics released a teaser image (above) of Selina surrounded by cats while holding a copy of 'Batman' #50 that arrives on July 4, the same day as 'Catwoman' #1. Check out the solicitation below for 'Catwoman' #1 and remember to pre-order it with your local comic book store.